Cass. 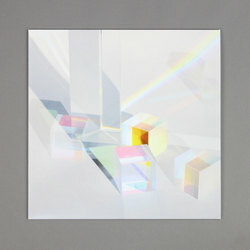 - Postclub Prism. Vinyl LP. Bleep. 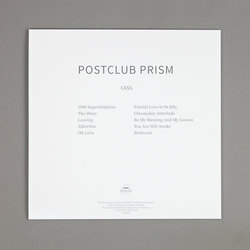 Greek label Into The Light kick off a new series with an LP from German producer Cass.. Postclub Prism signposts its intentions pretty clearly with both its title and its artwork. This is indeed a ‘postclub’ record in all senses of the term - both music to be heard as the night is winding down, but also tracks made in the style of the current crop of club-adjacent/deconstructionist/ambient artists. Tracks such as ‘Livia’, ‘Be My Blessing And My Lesson’ and ‘Painful Love In 96 kHz’ are built on gorgeous, slightly wistful synth drones that make for perfect sunrise soundtracks. Fans of Seahawks and the more weightless end of FaltyDL step this way. 1 1000 Superdolphins 1:14 Cass. 2 The Diary 2:00 Cass. 5 Oh Livia 0:32 Cass. 6 Painful Love In 96 KHz 2:00 Cass. 7 Chromakey Interlude 0:57 Cass. 8 Be My Blessing & My Lesson 2:00 Cass. 9 You Are Still Awake 0:31 Cass.